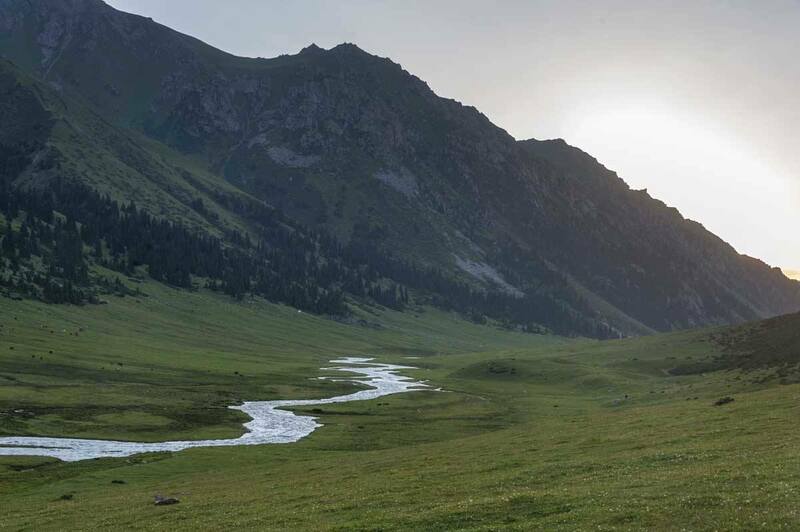 Hiking in Kyrgyzstan is the ideal adventure for all those looking for unspoilt landscapes, challenging mountain passes and off the path experiences with no other tourists in sight. 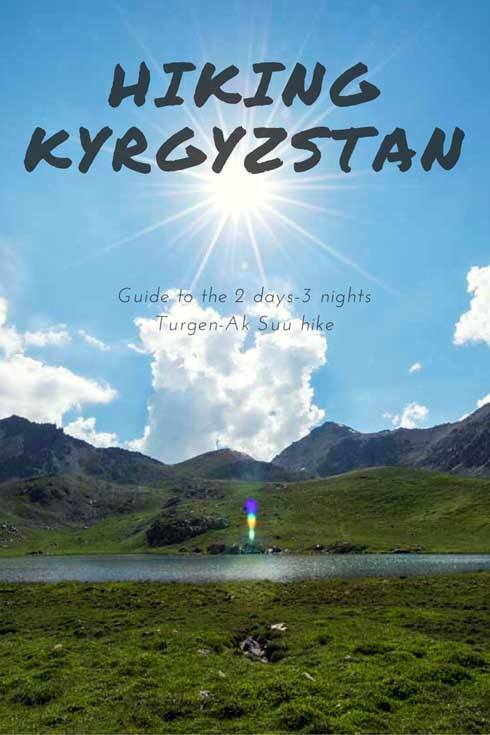 Here is our account and how-to map of the new Turgen-Ak Suu hike, a three (or four) day experience in the Tien Shan mountains of eastern Kyrgyzstan. If you want to know more about hiking in the country, don’t forget to visit Jyrgalan, the best little village in Kyrgyzstan! Before travelling to Kyrgyzstan I knew next to nothing about the country. I knew it was in Central Asia, and that it hosted the biennial World Nomad Games. That’s it. I had no idea it was one of the most mountainous countries in the world, with peaks over 7000 meters – like the famous Peak Lenin, straddling the border of Kyrgyzstan and Tajikistan – and that it has all the cards to become one of the world’s best hiking paradises, a few years from now. 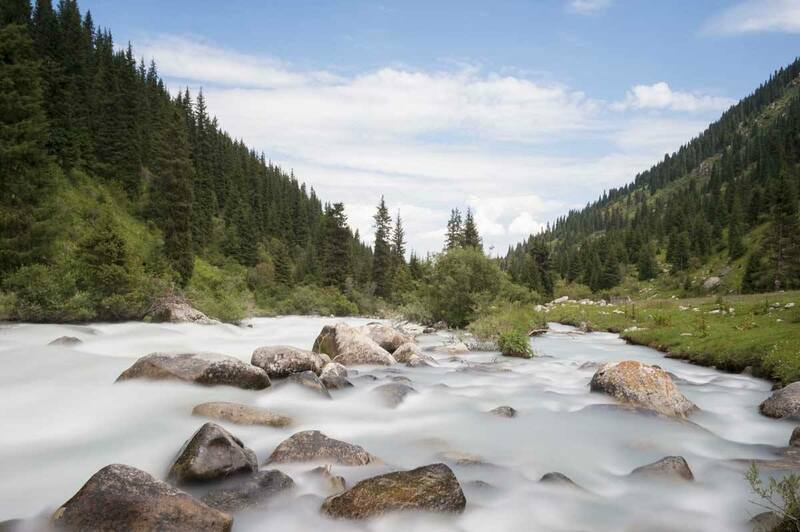 Kyrgyzstan has plenty of one thing that all mountain lovers look for in their escapades – wilderness. 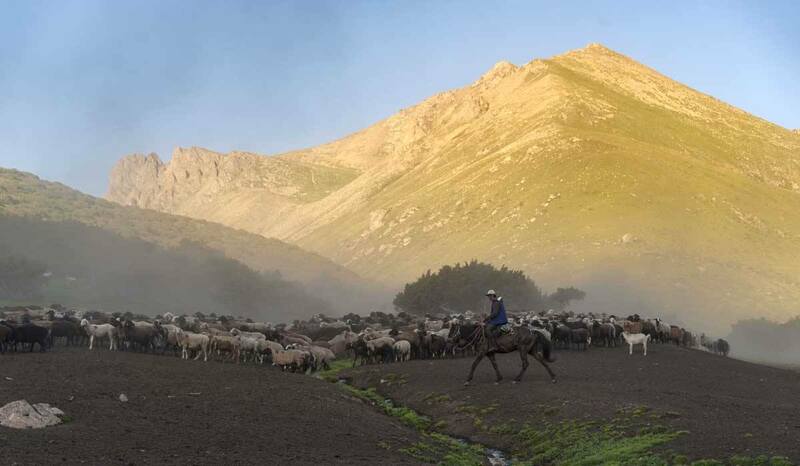 The country is still visited by relatively few adventurers every year, and with over 90% of its territory covered in mountains, you may not run into anyone else during your hike, save for shepherds and their flocks making for the jailoo (high pastures). This was exactly our experience during the 3-day Turgen-Ak Suu hike, crossing wildflower-covered passes, circling sapphire Alpine lakes and walking along silvery, rushing rivers, born from glaciers with no name. Three days with no houses, no roads, no power lines in sight – with no companionship besides that of our fellow hikers and guides, no sounds beside those of nature. Yet, with all off-the-beaten-path adventures, the Turgen-Ak Suu hike requires some planning. 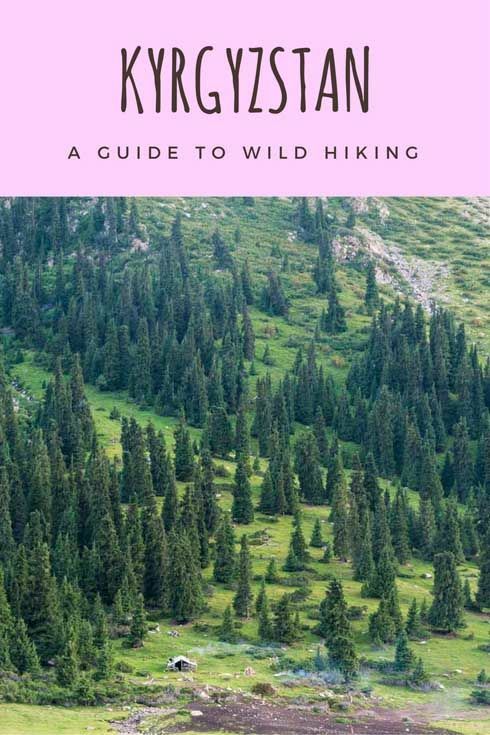 That’s why we’ve decided to put together this guide, including all there is to know about the hike – including practical info on how to plan it, what to pack and more, and a detailed day-by-day guide. 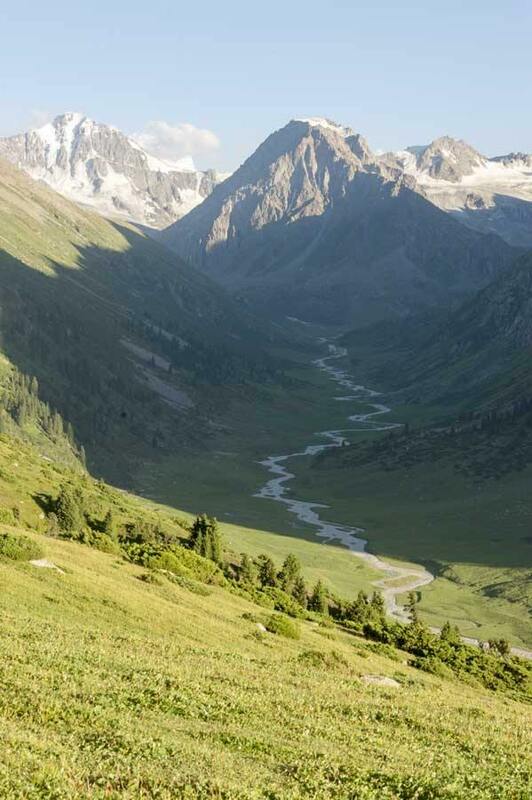 There are several trail option in Kyrgyzstan that are perfect for independent hikers, but the Turgen-Ak Suu hike isn’t one of them, unless you’re very very good with a map and compass. We visited in late July 2017 and at the time, the path wasn’t marked. Can you see a path anywhere? On top of that, you will be walking up to 8-9 hours a day in altitudes exceeding 3000 meters, and nights will be spent camping in the mountains. The hike is too high and steep for horses, so you’d have to carry all your own equipment and food. Do you really want to do that, and risk getting lost in below-freezing temperatures? 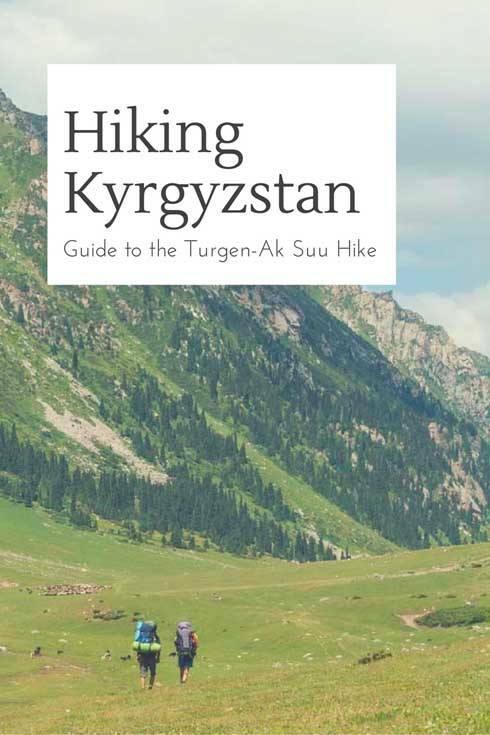 We highly recommend doing the Turgen-Ak Suu hike with a local guide, porters and a mountain cook. 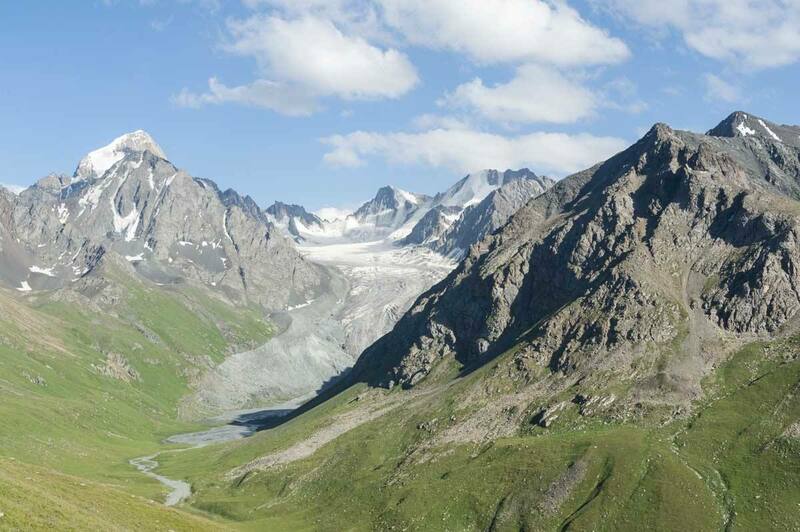 You can arrange everything you need at EcoTrek, a Karakol agency specialising in trekking and mountaineering. Eco Trek also offers equipment for hire – tents, sleeping bags, mats and even jackets and backpacks are all available. For all other enquiries you can also get in touch with Destination Karakol, the local tourism office. Destination Karakol also organises walking tours and other cultural experiences around the city, including an amazing Dungan culture and cuisine tour in a nearby village. 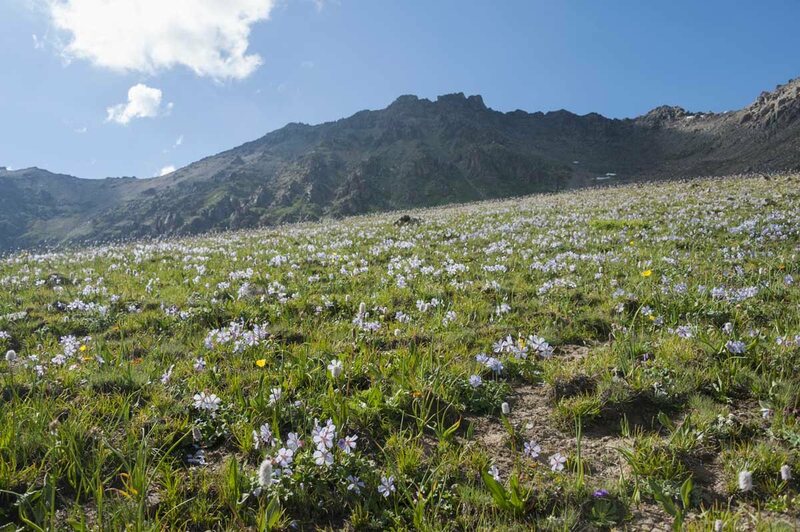 The Turgen-Ak Suu hike can be completed in three or four days – we hiked it in three days and will be describing this option in the Itinerary section below, but EcoTrek recommends choosing the four-day option. 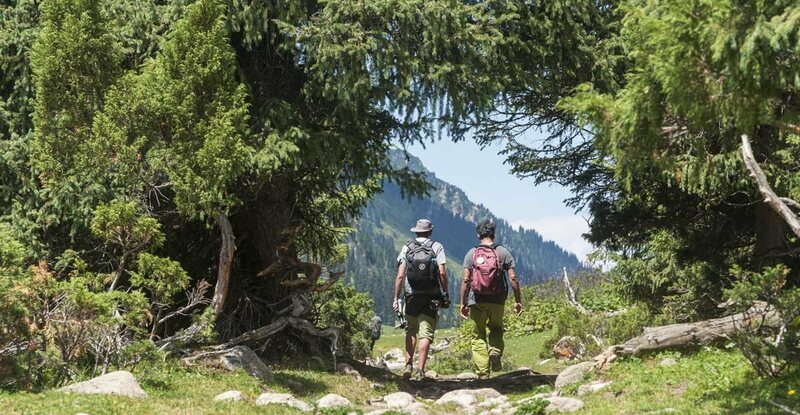 In 2017, EcoTrek charged €773 for one person for the four-day hike, €871 for two people and €1333 for four. These prices include transport between Karakol and the trail, a guide, porters, a cook and three meals a day for the duration of your hike. What will you be eating during your hike? Breakfast includes eggs as well as the usual ‘continental breakfast’ goodies, and naturally some tea and coffee. Lunch will be fruit and sandwiches (local cheese is really delicious!) and dinner includes soup or another hot dish and salad. Snacks like dried fruit, nuts , biscuits and honey/chocolate spreads will be on offer with all meals. If you’re vegetarian your dietary needs will be catered for, but vegan and gluten-free travellers will probably have some issues – make sure you discuss your dietary requirements with the agency before booking your trek. Saucepans, plates and cutlery can also be hired. Please enquire directly. Tips are also very much appreciated – as a guideline, we were told to give approximately 500 som per day to each to the guide, porters and cook. However, as always tips are up to you. On the way to Kyrgyzstan I watched a documentary on the plane about a team of researchers heading to the high mountains to track snow leopards. A scene stuck with me. One of the researchers was sitting under a storm with his camera. The storm turned into a blizzard, and then into sunshine. ‘If you’re looking for perfect weather, you just need to wait’, the researcher said. You know the ‘four seasons in one day’ scenario? You may even get four seasons in one hour! Lots of powerbanks as there’s nowhere to charge up – here’s the [easyazon_link identifier=”B00MQSMEEE” locale=”US” tag=”thecrowdedpla-20″]RAVPower[/easyazon_link], our favourite powerbank! On top of that, you’ll also need camping equipment – we rented it from EcoTrek and it was in excellent conditions. The sleeping bags were very warm and perfect for chilly nights at 3000 meters. Check out our long distance hiking packing list for more info! 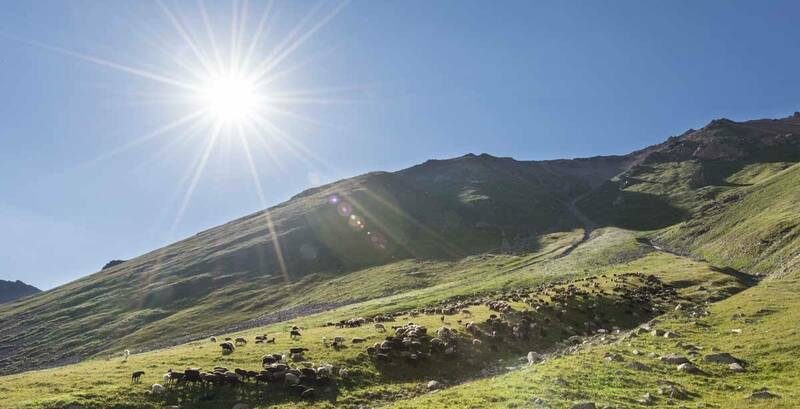 The hiking season in Kyrgyzstan goes from June to September, and that includes the Turgen-Ak Suu hike. We did it in late July, and the weather was ideal – sure, we had a couple of showers and it got very cold during the night, but that’s to be expected considering that most of the trail is over 3000 meters. We found no snow at all, not even when we crossed the 3700 meter-high Ailanysh pass on the second day. However, if you’re hiking earlier in the season snow is a definite possibility on the high passes – make sure you dress up extra warm and take warm hiking boots. If you’re visiting Kyrgyzstan in winter hiking isn’t really an option, but there are several ski touring opportunities. 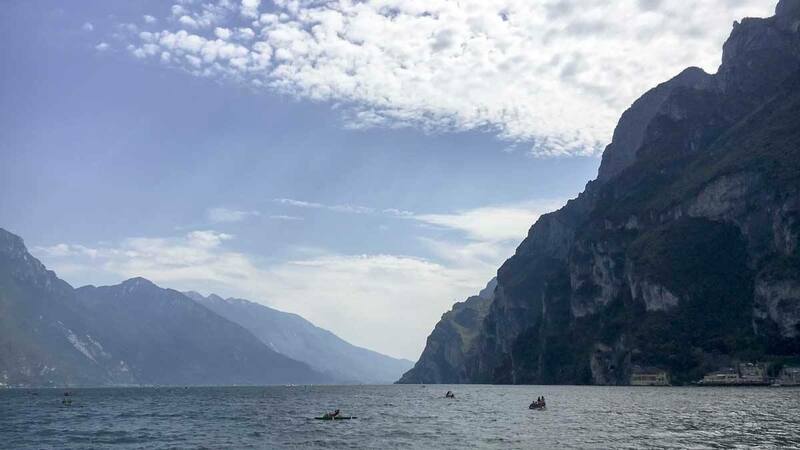 If you’ve only been hiking in well-beaten places like Lake Garda, the Finnish Archipelago and Slovenia till now, you may be in for a little (pleasant) surprise. Kyrgyzstan is wild. Probably one of the wildest places we’ve ever been to. During the our hike we had no phone reception, and didn’t meet anyone besides a couple of shepherds the whole way. That means you need to be prepared, because there’s limited helicopter rescue service to get you out if things go wrong. On the last day on our hike I fell while stepping on rocks to cross a river, and I sprained my left ankle really badly. We still had 4 hours to go before the end, and there was no way I could walk the whole way. We were lucky to find an elderly shepherd who let me ride his horse all the way to Ak Suu village, our pickup point. Otherwise, it would have been extremely difficult and painful for me to finish the hike. Lots of sheep… that’s why we recommend sterilising your water! Here are some tips on what to expect during the hike, and how to have a great time and stay safe! Make sure you have a [easyazon_link identifier=”B003A1MURC” locale=”US” tag=”thecrowdedpla-20″]Steripen[/easyazon_link], [easyazon_link identifier=”B00H90PFOK” locale=”US” tag=”thecrowdedpla-20″]Lifestraw[/easyazon_link] or Micropur tablets, as well as a refillable water bottle. There are plenty of streams along the way, but given the presence of sheep and cattle water may not be safe to drink. Our EcoTrek guide had a first aid kit with him, but that didn’t include bandages and when I injured my ankle he cut one of his t-shirts into strips to bandage my foot. Don’t forget to take some bandages with you, as well as any medication you might need – just in case! Take some emergency money with you. If something happens, you will have to pay to hire a horse or to send someone ahead to get help. We paid 2000 som to hire a horse for the day. Be very careful along the path. The trail is not yet properly marked, and it crosses several streams as well as swampy areas and sections covered in boulders. Always watch your step! By all means be prepared, but don’t take too much stuff – the porters are not your personal pack horses. The total distance of the Turgen-Ak Suu hike is 47 km. 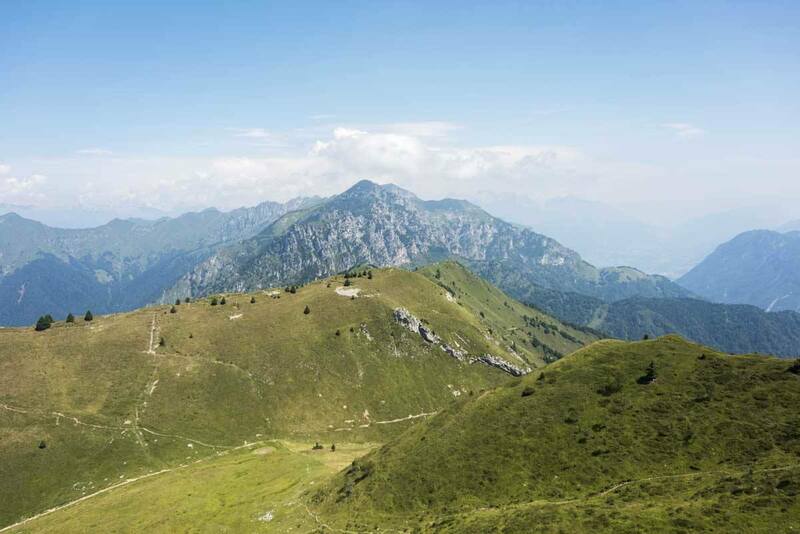 Total elevation gain is 1920 meters, and elevation loss is 2470 meters. 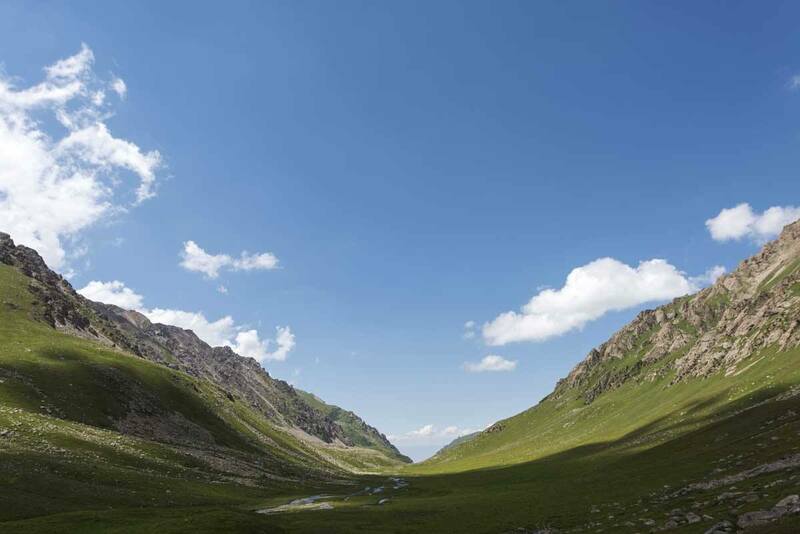 The trail starts in the Turgen-Ak Suu valley, about an hour and a half from Karakol by minibus, and crosses two mountain passes before reaching the Almalu valley, before ending at Ak Suu village. As I mentioned above in the trip costs section, the hike can be covered in three or four days. We did it in three days, and that’s what I’ll describe below in the daily breakdown section, but we highly recommend opting for the four day option if you can, to avoid long hiking days and enjoying the experience more. We found that local guides underestimated hiking times – whenever they said 4 hours it was more like 6, and 6 hours were more like 8. So be prepared for that. Also, the hike is almost entirely unmarked and the trail is pretty much non-existent. Get ready for a wild ride! Our hike began with a minivan ride from our guesthouse in Karakol all the way to the Turgen-Ak Suu valley. We started hiking at approximately 2700 meters of altitude, after the van dropped us off on the shores of a rushing glacial river. A log bridge had recently been washed away by a flood, so we had to take a quick detour upstream to find a ‘functioning’ bridge – an alternative would have been crossing the river by horse, for an extra fee to be discussed with local horsemen. The landscape at the start of the hike looked uncannily similar to South Tyrol, with mountainsides covered with fir forests and meadows blanketed with wildflowers. I recognised several Alpine flower varieties like fluffy edelweiss, very rare in the Alps but abundant in Central Asia, and gentiana, a purple-blue trumpet-shaped flower. It was a gloomy day, with clouds hanging low like heavy boulders, and soon enough it started to rain. It rained almost the whole way up the 3500 meter-high Bozuchuk Pass, a steep and slippery climb following a faint trail covered in rocks. At the pass, a timid sun peeked through the clouds, turning the mountainscape into a Cezanne painting. We were surrounded by peaks on all sides – snowcapped peaks, rocky peaks, glacier-covered peaks, peaks surrounded in clouds. We started our descent, making for the valley below. The way down included several sections of damp, hummocky ground and rock-covered moraines – watch your step very very closely. 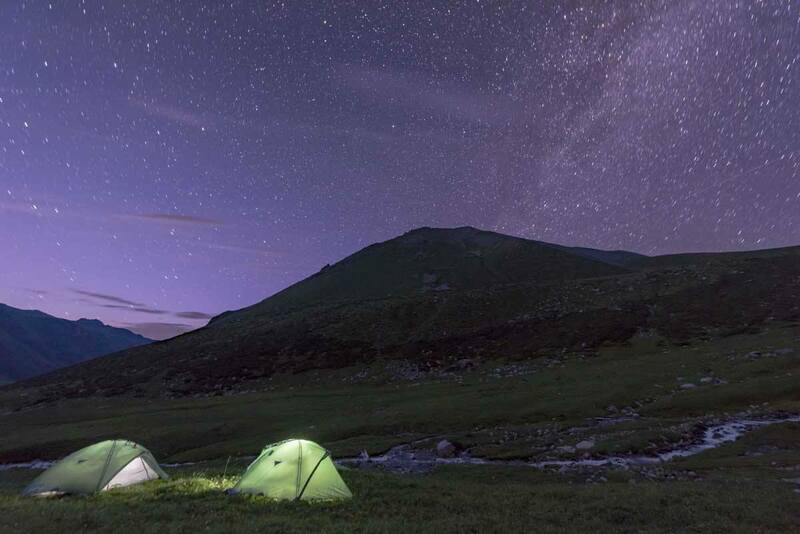 We camped in the Jergez valley, not far from a stream and under stars so bright we felt as if we could touch them. Day 2 was a very long and exhausting day on the trail – but it was also one of the most spectacular hikes ever. We started with a very steep ascent towards the first of the two passes of the day. A small stream ran alongside our path, cascading between pink and golden granite, a welcome source of refreshing water. Once we summited Ailanysh pass (approx 3700 meters) we could see one of the highlights of our hike – the twin Ailanysh mountain lakes, one sapphire-coloured and one pale aquamarine, like a sparkling beacon leading us to our lunchtime spot. However, it was at least a couple of hours before we could reach the lake shore – first we had to descend to the stream at the bottom of the valley, traversing a tricky moraine full of unstable boulders, and then climb again until we reached the lakes. After lunch, we circled the lakes and made for the second pass of the day, visible on our right-hand side. The wildflowers changed as we climbed – from ember-coloured dandelion to tiny amethyst daisies, lavender-looking flowers and finally a carpet of golden buttercups, covering the second pass of the day. Once we crossed the second pass, we could see the Almalu valley below us, and a glacier covering the peak of one of the mountains. I asked our guide Ermek what the glacier was called, and he replied ‘it doesn’t have a name’. 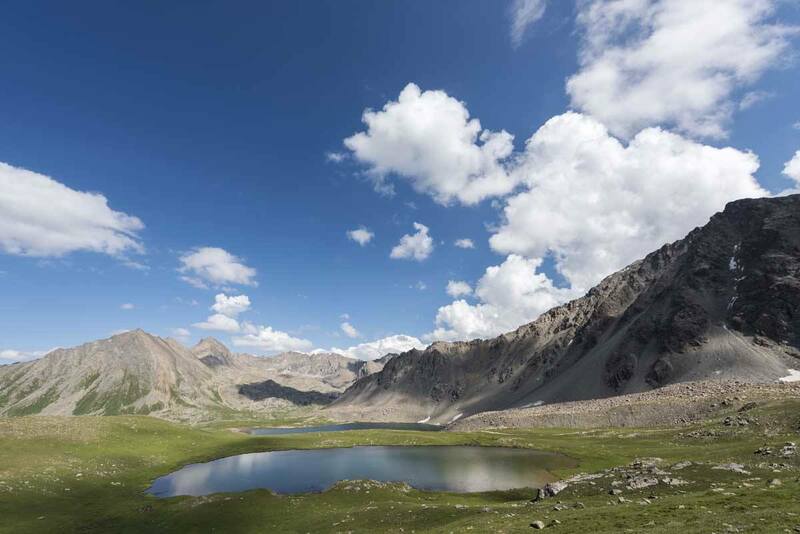 This is the beauty of hiking in Kyrgyzstan – the territory is still wild, unnamed, uncharted. We spent the last two hours of the day descending towards our second campsite in the Almalu valley, crossing paths with cows, sheep and horses grazing in the jailoo. The final day was supposed to be a long but easy hike following the river running across the Almalu valley all the way to Ak Suu village, the end of the trail. We took our time photographing the silvery waters of the river, flowing from the No-Name glacier we had spotted the previous day, and admiring the stunning landscape surrounding us. The trail was mostly flat, with none of the tricky moraines and steep, slippery passes we had encountered over the previous two days. Yet, all hikers know that disaster always strikes when you least expect it. I was hopping on rocks to cross a small stream when I lost my footing, twisted my left ankle and fell into the mud. My first concerns were for my camera and phone – then I tried to stand up, and realised I couldn’t. My ankle was swollen and sore, pulsating like crazy. After keeping my foot in the icy river for close to an hour, our guide Ermek fashioned a compression bandage from one of his old t-shirts that kept my foot in place long enough to hobble to a nearby jailoo, where we convinced an elderly shepherd to let us rent his horse to take us all the way to Ak Suu. Besides my injury, the last day of the Turgen-Ak Suu hike was also a spectacular one. Slowly, one footstep after another, we made our way out of the valley, away from the mountains and back towards ‘civilization’. When donkeys and horses were replaced by rusty Lada, and we saw the first powerlines appear beyond the treetops, we realised that our trek was about to become a beautiful memory. 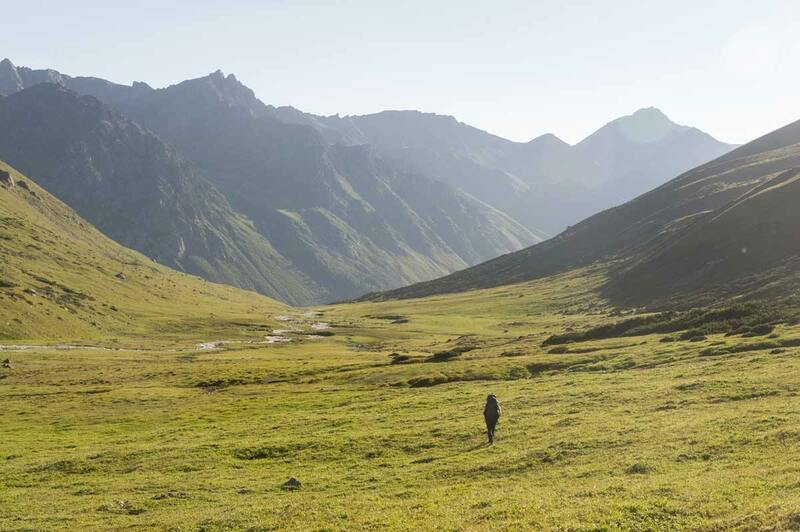 Before and after your hike, you’ll be staying in Karakol. This small town in eastern Kyrgyzstan is a wonderful place to while away a couple of days, getting used to the altitude and the rhythms of Kyrgyzstan. If you have questions about the hike, your best bet will be heading to the EcoTrek office on Abdrahmanov Street, while for questions about Karakol and surroundings you can make your way to the Destination Karakol office on Gagarin Street. Karakol is also a great place to explore the mixture of cultures and people that makes Kyrgyzstan a truly special place. Destination Karakol organizes a walking tour, introducing visitors to the main sights in town – from the Russian Orthodox church and Russian ‘gingerbread houses’ to the Tatar mosque, the city bazaar and my favourite sight of all, the Dungan mosque, looking like a hybrid between a mosque and a Chinese temple. You can also opt for a tour to a nearby village to learn more about Dungan culture, and enjoy a delicious dinner with a Dungan family. If you are in Karakol over the weekend, don’t miss the Animal Market on Sunday morning, where live animals are bought and sold from farmers and traders from all over Central Asia. Make sure you set your alarm, the best time to visit is around 6-7 am. 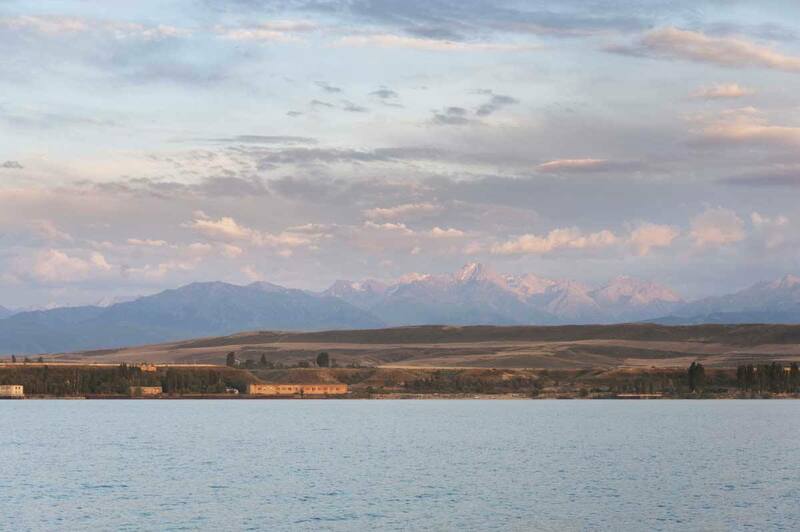 Another wonderful sight located a short distance away from Karakol is Issyk-Kul lake, the second largest Alpine lake in the world and a popular swimming and sunbathing destination – there’s nothing better than a swim to relax after a hike! We can recommend two places to stay in Karakol – the first is Hotel Karagat, one of Karakol’s largest hotels with spacious rooms and a sauna in the basement. The hotel is very comfortable and a great option if you just want to chill before or after the hike. Service cannot be faulted – all in all, Karagat looks and feels like a large chain hotel. If you are looking for something a little cosier, head to Tagaytay Guesthouse, a family-run place where you can experience Central Asian hospitality as well as enjoying a comfortable rest. It may not look as grand as Karagat, but the warm welcome of the host family and the delicious breakfast more than make up for it. Our trip was organised by Discover Kyrgyzstan, and made possible by the support of the American people through the United States Agency for International Development (USAID). The contents are the sole responsibility of the author and do not necessarily reflect the views of USAID or the United States Government.